Skin To Skin - "Temenos"
Skin to Skin are a duo of Lena Mändotter and Ronnie Hall plus guest musicians, and hail from Malmö in Sweden. I saw the band live back in March of 1999 and described the show as some sort of lo-fi ethnic dub trance thing. It was a very cool show. This is something completely different. This CD is a very spaced eerie sounding set of music, clearly meant to make you travel back in time and walk around amongst the dead or living in ancient times. It creates a sort of dreamy state quite effectively, with droning vocals, harp-lute style guitar and ethnic percussion. 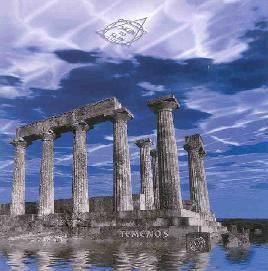 The title track is a long piece and in Greek means a sacred space or site for reflection. I enjoyed this CD very much for just hearing late at night and being transported away, far away, to another world. Excellent stuff. For more information you can visit the Skin To Skin web site at: http://www.skintoskin.nu/. Temenos is distributed by Waveform. You can visit their web site at: http://www.waveformhq.com. Contact via snail mail c/o Waveform Records; PO Box 12684; La Jolla, CA 92039-2684.